Want to put shutters on your French doors? We can help you find the right shutter style and design for you. 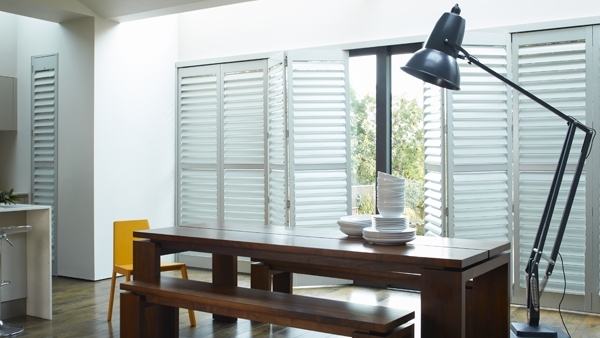 What are the benefits of shutters for French or patio doors? Whether you have traditional double French doors or contemporary folding, sliding patio doors, shutter door window dressing is the perfect addition. Why? First of all, if they are installed on a track they can be pushed to the side to enhance the view looking out the doors. They look super smart – which is especially important if you are designing an open-plan space that includes other windows which can be fitted with them too. Shutters also allow you to control the privacy and lighting in your room – perfect if yours is a space that’s overlooked or is south-facing and tends to overheat in summer. Then there’s the easy maintenance – a light dusting will be sufficient for shutters on French doors in a living room, or a wipe with a damp cloth for those in a kitchen diner. Other shutter benefits include reduced energy use and sound reduction through insulation – a must for rooms with large expanses of glazing. How easy is it to install shutters on French or patio doors? Option one (best suited to narrower expanses): attaching window shutters to external French doors. The obstacle to overcome with this method is that the wide expanse and the requirements to use the doorway mean that the width of the panels away from their anchoring points is notably further than that of a normal window shutter. The most common method of attaching plantation shutters to French doors is simply making the panels a lesser width. By lessening the width of the panels, it puts less stress on the hinges which avoids shutters dropping over time. Option two (a good choice for wider expanses): fit the shutters on a track system. Instead of freely swinging to concertina shut (as above), the shutters are attached to metal rails, either at the top of the shutter, the bottom of the shutter – or in some cases both. This is achieved by attaching a small metal risen disk on to the top of the shutter panel; this then locks in to a clasping metal rail holding the shutters in the perfect position. This is essential for shutters over a certain width to ensure they function properly and do not drag. 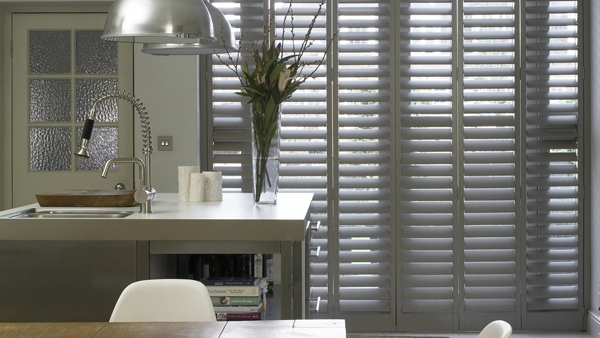 Which tracked shutters to choose for your French or patio doors? The first tracked plantation shutters are bi-fold. These shutters work in the same way as normal shutters: they are hinged and concertina together to fully open and close. Of course, the slats in these must be closed before they can concertina away to ensure the panels lay flat against each other. These shutters are connected by certain points at the top or top and bottom of the shutter along a rail, so they smoothly hold position as they fold. This tends to be the more commonly used form of tracked shutter. The second tracked plantation shutters are known as bypass tracked shutters. These shutters work with the panels always holding a position parallel to the window and fixed at two points into a top and bottom track. These shutters, locked in their parallel position, are on two rails of track, allowing them to ‘bypass’ the other panel passes. This design is less commonly used as, depending on the quantity of panels, you will always have a number of plantation shutter panels covering your window. That said, for some rooms, such as smaller spaces, this is the best – or only – design solution. Which shutter designs work best for French or patio doors? Due to the obvious need to connect your shutters to the tracked shutter system, the only design of window shutter available for track shutters is full-height plantation shutters. These shutters cover the entire height of your window with one panel, and can have their slats separated by utilising a mid-rail, which you may want to position at the same height as any mid-rail – or the handle position – of your door. The mid-rail, by the way, is a beam of solid wood that goes across the panel allowing two groups of slats to be operated independently of each other. The bulkiness or depth of your doors’ interior handles may affect the position and installation method of your shutters – this is something to factor in when measuring up. If you’re not sure, ask one of our advisers. 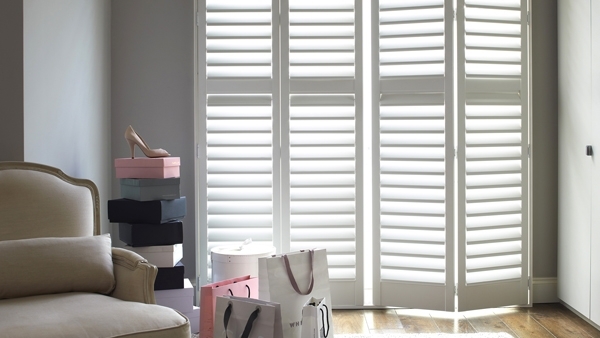 If your folding sliding doors fold into your room, our shutters may not be an option. Discuss with our advisers before ordering. 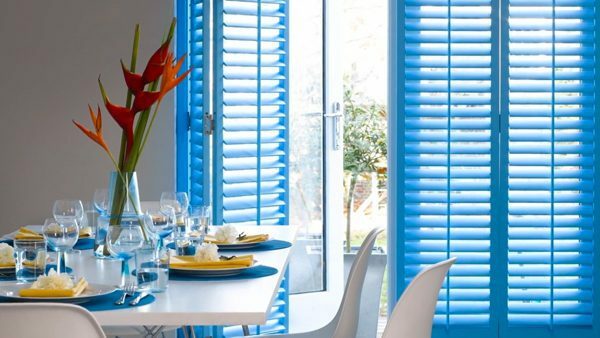 If you have any questions on tracked shutters, or any issues with plantation shutters for your French doors, book an appointment, no obligations and we’ll be in touch to arrange a home visit and discuss your options. I want to make sure that I get the right doors for my patio. It makes sense that I would want to get some french doors! I think the folding motion that they do is really interesting and it looks nice.